Claire Messud presents "The Burning Girl"
Please join us on Sunday, December 3 at 3pm, when Claire Messud presents her novel The Burning Girl. The event is free and open to the public; there will be tiime for Q&A and book signing. Julia and Cassie have been friends since nursery school. They have shared everything, including their desire to escape the stifling limitations of their birthplace, the quiet town of Royston, Massachusetts. But as the two girls enter adolescence, their paths diverge and Cassie sets out on a journey that will put her life in danger and shatter her oldest friendship. The Burning Girl is a complex examination of the stories we tell ourselves about youth and friendship, and straddles, expertly, childhood’s imaginary worlds and painful adult reality—crafting a true, immediate portrait of female adolescence. Thursday, Mar 27 at 7PM BookPeople Presents Bestselling Author of The Emperor's Children Claire Messud speaking & signing The woman upstairs PLEASE READ: The speaking portion of this event is free and open to the public. Tickets are required to join the signing line at this event. Books & tickets are available for pre-order. Purchasing a book online automatically assigns you a ticket for the signing. There is no separate "ticket" item to add to your cart. If you cannot make it to the event, you can order a signed copy. Add the book to your cart and write "SIGNED COPY" in the comments field during checkout. We ship all over the world! From the bestselling author of The Emperor's Children, a masterly new novel: the riveting confession of a woman awakened, transformed and betrayed by a desire for a world beyond her own.The woman upstairs is the story of Nora Eldridge, an elementary school teacher in Cambridge, Massachusetts, long ago compromised her dream to be a successful artist, mother and lover. She has instead become the "Woman Upstairs," a reliable friend and neighbor always on the fringe of others' achievements. Then into her life arrives the glamorous and cosmopolitan Shahids--her new student Reza Shahid, a child who enchants as if from a fairy tale, and his parents: Skandar, a dashing Lebanese professor who has come to Boston for a fellowship at Harvard, and Sirena, an effortlessly alluring Italian artist. When Reza is attacked by schoolyard bullies, Nora is drawn deep into the complex world of the Shahid family; she finds herself falling in love with them, separately and together. Nora's happiness explodes her boundaries, and she discovers in herself an unprecedented ferocity--one that puts her beliefs and her sense of self at stake. Told with urgency, intimacy and piercing emotion, this brilliant novel of passion and artistic fulfillment explores the intensity, thrill--and the devastating cost--of embracing an authentic life. 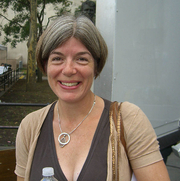 Claire Messud was born in the United States in 1966. She was educated at Yale and Cambridge. Messud’s The Emperor’s Children, was a New York Times, Los Angeles Times, and Washington Post Best Book of the Year. Her first novel, When the World Was Steady, and her book of novellas, The Hunters, were both finalists for the PEN/Faulkner Award; and her second novel, The Last Life, was a Publishers Weekly Best Book of the Year and Editor’s Choice at The Village Voice. All four books were named New York Times Notable Books of the Year. Messud has been awarded Guggenheim and Radcliffe Fellowships and the Strauss Living Award from the American Academy of Arts and Letters. She lives in Cambridge, Massachusetts, with her husband and children. In order to have anything signed at a BookPeople event, a copy of the event book must be purchased from BookPeople. If you purchase your book from BookPeople in advance of the event, please save your receipt and present it at the event. Thank you for supporting Claire Messud & your local independent bookstore! “A powerful psychological thriller . . . As in a fairy tale, Nora becomes spellbound by a family that seems to embody what she is missing. The power of self-deception is one of the key themes. . . . This is not just a novel of real psychological insight. It is also a supremely well-crafted page-turner with a shocker of an ending.” Julia M. Klein, The Boston Globe "A rare work of fiction seemingly destined to become a cultural benchmark, a byword even...The Woman Upstairs forces itself on you, demands your attention, impresses and irritates. There is a genuine sense of unease in these pages, of something solid being overturned by the sheer force of Nora’s rage. . . . Causing a disturbance is the point. It is an altogether impolitic piece of artistry. It is a big, defiant gesture of the sort that women like Nora fear they no longer have within them.” Sam Sacks, The Wall Street Journal Claire Messud’s most recent novel, The Emperor’s Children, was a New York Times, Los Angeles Times and Washington Post Best Book of the Year. Her first novel, When the World Was Steady, and her book of novellas, The hunters, were both finalists for the PEN/Faulkner Award; and her second novel, The last life, was a Publishers Weekly Best Book of the Year and Editor’s Choice at The Village Voice. All four books were named New York Times Notable Books of the Year. Messud has been awarded Guggenheim and Radcliffe Fellowships and the Strauss Living Award from the American Academy of Arts and Letters. She lives in Cambridge, Massachusetts, with her husband and children. Friday, June 7th at 7 pm - Claire Messud, "The Woman Upstairs"
Please join us at the Bookshop on Friday, June 7th at 7 pm as we welcome Claire Messud, discussing her latest novel, The woman upstairs. Claire Messud’s most recent novel, The Emperor’s Children, was a New York Times, Los Angeles Times and Washington Post Best Book of the Year. Her first novel, When the World Was Steady, and her book of novellas, The Hunters, were both finalists for the PEN/Faulkner Award; and her second novel, The Last Life, was a Publishers Weekly Best Book of the Year and Editor’s Choice at The Village Voice. All four books were named New York Times Notable Books of the Year. Messud has been awarded Guggenheim and Radcliffe Fellowships and the Strauss Living Award from the American Academy of Arts and Letters. She lives in Cambridge, Massachusetts, with her husband and children. From the New York Times best-selling author of The Emperor's Children, a masterly new novel: the riveting confession of a woman awakened, transformed and betrayed by a desire for a world beyond her own. Nora Eldridge, an elementary school teacher in Cambridge, Massachusetts, long ago compromised her dream to be a successful artist, mother and lover. She has instead become the "woman upstairs," a reliable friend and neighbor always on the fringe of others' achievements. Then into her life arrives the glamorous and cosmopolitan Shahids, her new student Reza Shahid, a child who enchants as if from a fairy tale, and his parents: Skandar, a dashing Lebanese professor who has come to Boston for a fellowship at Harvard, and Sirena, an effortlessly alluring Italian artist. When Reza is attacked by schoolyard bullies, Nora is drawn deep into the complex world of the Shahid family; she finds herself falling in love with them, separately and together. Nora’s happiness explodes her boundaries, and she discovers in herself an unprecedented ferocity, one that puts her beliefs and her sense of self at stake. Told with urgency, intimacy and piercing emotion, this brilliant novel of passion and artistic fulfillment explores the intensity, thrill, and the devastating cost, of embracing an authentic life. Claire Messud's most recent novel, The Emperor's Children, was a New York Times, Los Angeles Times and Washington Post Best Book of the Year. Her first novel, When the World Was Steady, and her book of novellas, The hunters, were both finalists for the PEN/Faulkner Award; and her second novel, The last life, was a Publishers Weekly Best Book of the Year and Editor's Choice at The Village Voice. All four books were named New York Times Notable Books of the Year. Messud has been awarded Guggenheim and Radcliffe Fellowships and the Strauss Living Award from the American Academy of Arts and Letters. She lives in Cambridge, Massachusetts, with her husband and children. Claire Messud is currently considered a "single author." If one or more works are by a distinct, homonymous authors, go ahead and split the author. Claire Messud is composed of 3 names. You can examine and separate out names.